Nothing speaks of the family dining table like home cooked recipes demonstrated and tasted at Silver Dollar City’s Culinary and Craft School, sponsored by the magazine, Midwest Living®. Every season in the farmhouse-styled structure, guests have the opportunity to schedule a one-hour cooking class led by Debbie Dance Uhrig, a former music teacher, food columnist, and summer entertainer on the Golden Eagle Riverboat. Her daily classes feature the down-home cooking and fresh garden produce that were her heritage from Missouri parents and grandparents. The classes are casual, friendly, and revolve around easy conversation with the guests seated at a long table and counter in front of Debbie’s cooking center. Participants enjoy tiered seating and large plasma TVs to capture every detail of the delicious Midwest Living recipes Debbie recreates. Under her pen name, The Covered Dish, Debbie moved from music into cooking via a local newspaper column by the same name. However, cooking is something Debbie has done all her life, starting as soon as she could hold a spoon and stir. “Growing up, my family ate from the farm; my dad had a truck patch and two gardens. We also raised and butchered our own meats,” she says. In the Kansas City area where Debbie made her home as an adult, she started hosting cooking classes for children. Meanwhile, she wrote her first cookbook, aptly titled The Covered Dish. While on the road marketing her book, she met Silver Dollar City scouts, who were putting together the new culinary school, partnered with Midwest Living. “It was a God-driven journey,” Debbie says, noting that the 1890s-themed park with its family atmosphere embraced her. Working in the farmhouse-designed Culinary and Craft School creates a perfect environment for Debbie, her recipes, her hospitable welcoming personality, and the hospitality she exudes. 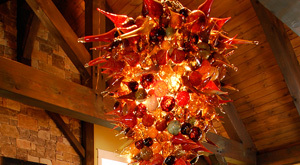 Silver Dollar City craftsmen created every artful detail in the white timber framed structure: hand-carved doors, a rustic mantelpiece and a blown-glass chandelier hanging in the living room. While the kitchen is state-of-the art, its warmth of rich wood tabletops, hand-hammered copper tiles, a cozy fireplace, and polished utensils hanging in easy reach create the nostalgia of an old-fashioned farm kitchen. And then, there’s the tantalizing scents of home cooking—herb-rubbed roasted chicken, pumpkin-spice fudge, and cinnamon apple bars. Plus the different kinds of cookies, cakes, and breads coming from the oven. When Midwest Living® was ready to bring its recipes to life with a cooking school, they looked no further than the Silver Dollar City theme park in Branson, Missouri. The park has long charmed visitors with its mix of craftsmanship, history, and entertainment. Their pride in regional traditions caught the magazine’s imagination. The staff at Midwest Living states that many of their personal stories are connected to the foods they grew up on and the recipes they pass down in the magazine—just as Debbie Uhrig draws from her childhood memories of her grandmother’s kitchen and the wholesome foods they prepared from the family’s garden and farm. Silver Dollar City is a place in the Ozarks dedicated to the region’s heritage and is a natural partner for showcasing the foods loved by Midwest Living’s readers. Debbie does not rewrite the Midwest Living recipes she demonstrates, but her classes are filled with her own practical tips. For instance, she prefers hand beating when mixing a cake. She always uses skimmed milk in breads. A teaspoon of cocoa in prize winning chili from Texas (no beans) adds timbre—a breath from nowhere else, she says. In chocolate chip cookies, she adds one-half teaspoon of cinnamon. And she adds a dash of horseradish to her dressings. Her demonstrations fit the season. For instance in September, she featured tail-gating fare, including Tortellini Chowder and Prairie State Oatmeal Cake. During the current Old Time Christmas Festival running from November 7 through December 30, Debbie is featuring a yummy snack mix called Christmas Crunch. She combines these addictive bites with a casserole that combines left-over turkey or chicken with vegetables in a creamy sauce. However, classes vary throughout the Christmas festival. (For a schedule, go to www.sdcculinarycraftschool.com.) A new twist for the season: two different sessions on make ahead edible gifts such as cranberry bran muffins and fruit and nuts oatmeal bars. Each session includes a recipe and a demonstration for homemade hand cream. Yeast bread classes are favorites at the Midwest Living Culinary & Craft School. During the current Christmas season, Czech Kolache is featured. This flexible snack/bread originated in central Europe and usually features a sweet fruit and cream cheese or poppy seed filling. More recently, savory has become a favorite with onion, sausage and even pizza flavored kolaches. Traditionally served at weddings, this round pastry found its way into our country in the 1850’s when Czech immigrants settled in Texas. Debbie prepares a special spiced tea to accompany this delicious class. An additional option at the culinary school for the Christmas season: a festive dinner on the wrap around porch followed by the perfect spot to view Rudolph’s Holly Jolly™ Christmas Light Parade. A holiday menu includes a relish tray, cinnamon pears, homemade bread, smoked turkey with cranberry apricot sauce, mashed potatoes, dressing, vegetable, and pumpkin-ginger pie. The special event requires registration and costs $45 per person plus tax. One last seating is available on December 4 at 5:00 p.m.
Children are welcome to classes at the discretion of parents/guardians and require a seat purchase. Seating in the Demonstration Kitchen is open 10 minutes prior to a scheduled class, available on a first-come basis following check in at the Midwest Living Culinary & Craft School. A One-Day Admission Ticket or Season Pass is required for park entry, but the culinary classes call for registration and an additional $15 fee. 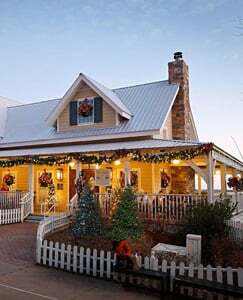 The Midwest Living Culinary & Craft School is located just past the entrance to Echo Hollow® Amphitheatre. Another interesting and very well written article by Arlene!